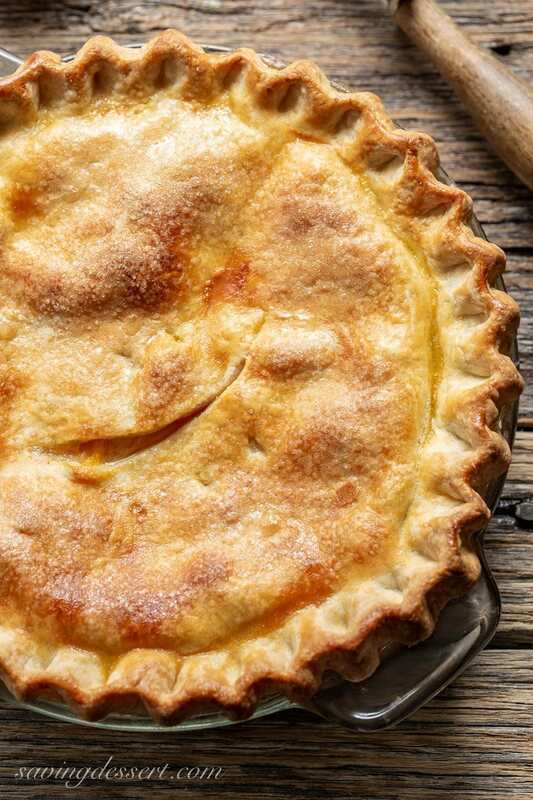 Check out our “how-to” video for Perfect Pie Crust! 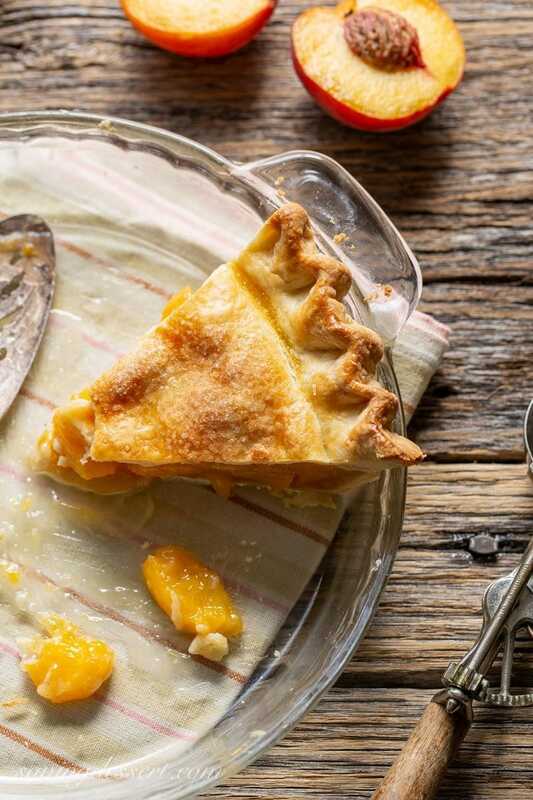 Fresh Peach Pie – made with juicy, ripe peaches and a flaky, buttery pastry crust. Don’t forget the ice cream! Way back in late 2010, I somehow got it in my mind that it’d be a good idea to make a pie-a-week for the entire year of 2011. It was a fun and amazingly interesting project, and I really made and posted 52 pies that year! This Fresh Peach Pie was No. 30. 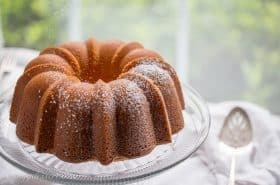 I’m grateful that we had a bunch of really nice taste testers that would stop by on Sundays to see what I made and take a bite or two. They offered feedback, encouragement, and were really great to work with, and I was thrilled to have help eating all those pies! Fresh fruit pies are always a favorite with our family. As usual, I also sought the opinion of my senior taste tester – traveling husband (who by the way has not traveled so much since I started making so many pies.) He said, “If you look up peach pie in the southerner’s dictionary, you’ll see a picture of this pie.” He went on to say “I’m from Atlanta and can tell you this is what a real peach pie tastes like.” Georgia peaches and all ya’ll 😉 I don’t think he’s going to say something less than complimentary … cause I didn’t marry no dummy! All joking aside, fresh fruit pies are my favorite too. It’s almost as if crust was invented just for amazing fruit fillings. The simple pies are some of the best, and this pie is simple and it’s one of the best!! Peaches are everywhere these days (in Virginia) and are very reasonably priced. Besides a double crust pastry, you’ll need 6 cups of peeled and sliced peaches (about 10-11 peaches), some lemon juice, corn starch, almond extract, butter, cinnamon, nutmeg, salt and sugar. All the basics! The filling is simple to make because the fruit does all the work for you. This Fresh Peach Pie is really easy to make but you do need a little time for the peaches to macerate and create plenty of syrupy juice. Toss fresh sliced peaches with sugar, cover and set aside for about an hour. While the peaches are making their syrup get everything else ready. I recommend making our Perfect Pie Crust the day before, or up to three days ahead, so it will be chilled and ready to roll out. From this point it comes together quickly and the reward is outstanding. 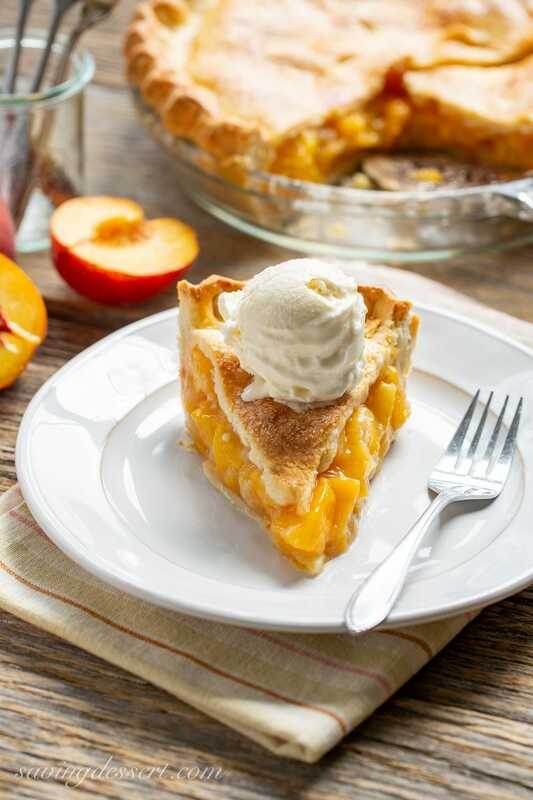 There is nothing like sweet, soft, syrupy peaches in a crispy, flaky buttery crust. If you allow the baked pie to cool to room temperature the filling will set-up enough to hold in place. Warm pie is phenomenal, so if you can’t wait and the filling spreads a little your pie eating friends won’t mind, especially if there is a scoop of ice cream on to!. 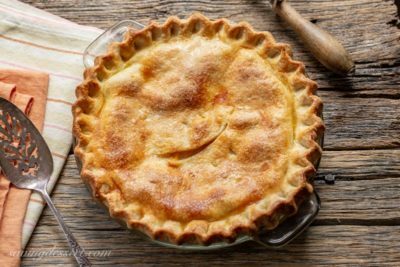 You can leave the pie at room temperature for a day or two, or refrigerate leftovers and have it around 4 or 5 days, if it lasts that long. The little bit of lemon juice helps keep the fruit looking fresh and adds a nice tart bite. Don’t skip the lemon juice! 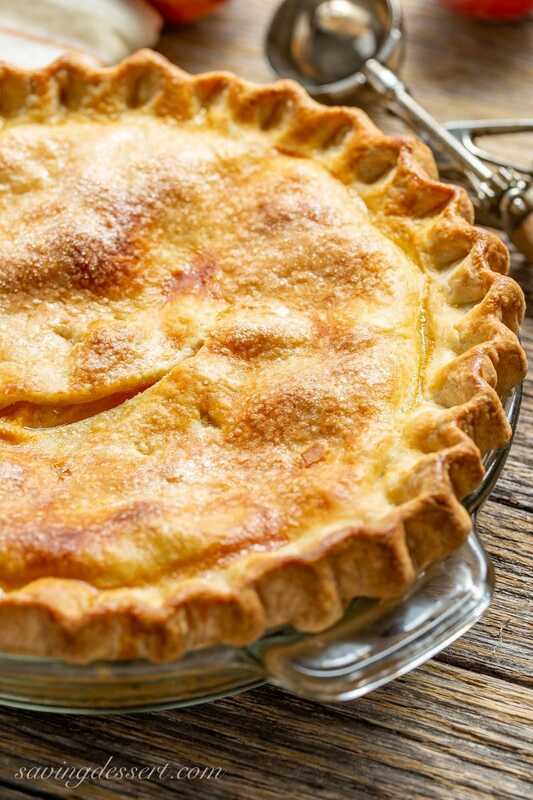 I hope you’ll try our Perfect Pie Crust in 3-easy steps. It’s super flaky, well tested, and then tested some more, and oh so good! Make the crust … you’ll love it too! This is how I like it … fresh peach pie and plain vanilla ice cream sprinkled with a little cinnamon. Goodness gracious! Good thing I only got one piece. My favorite (only) son stopped by with empty Tupperware containers and away it went! Buy local if you can. These peaches have spent less time traveling and more time on the tree to ripen! 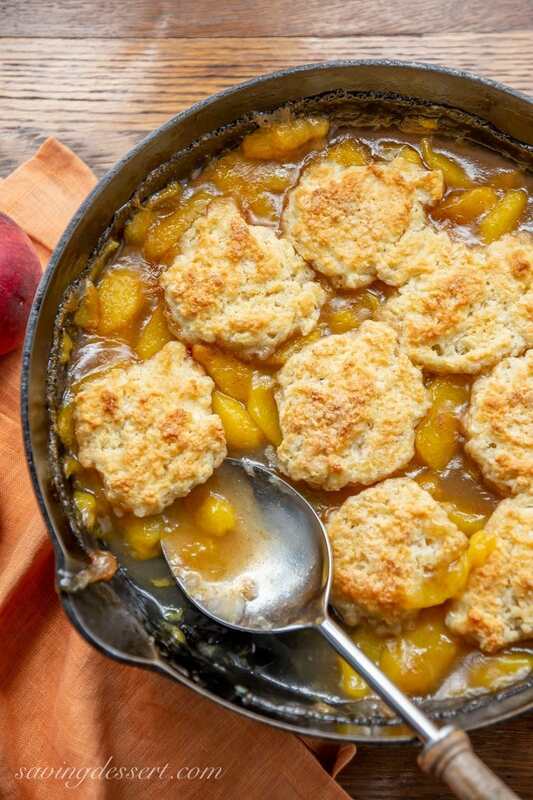 Old Fashioned Peach Cobbler with Shortcake Biscuit Crust – easy, homey and comforting just like mom used to make! 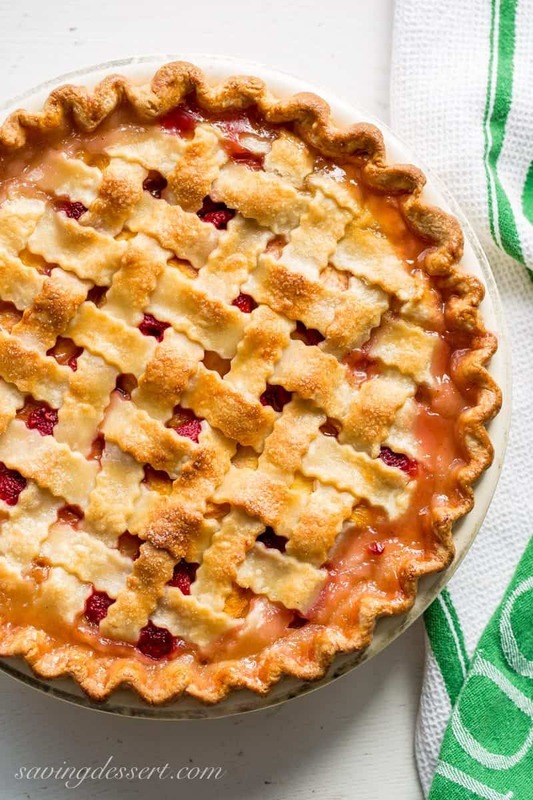 Peach Raspberry Pie with a Lattice Crust ~ juicy, sweet summer peaches are combined with tart raspberries for a wonderful seasonal dessert. Topped with a flaky, lattice weaved crust, this pie is a family favorite! Click over to check out our how-to video with step by step directions for making a lattice crust. 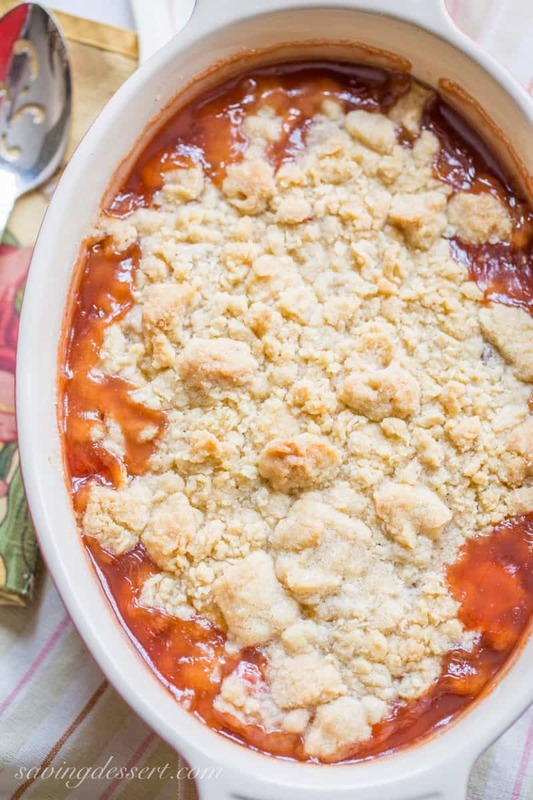 Easy Peach Crumble – Juicy sweet peaches are topped with a simple mixture made with butter, flour, cinnamon and sugar then crumbled on top. The aroma and flavor is heavenly! 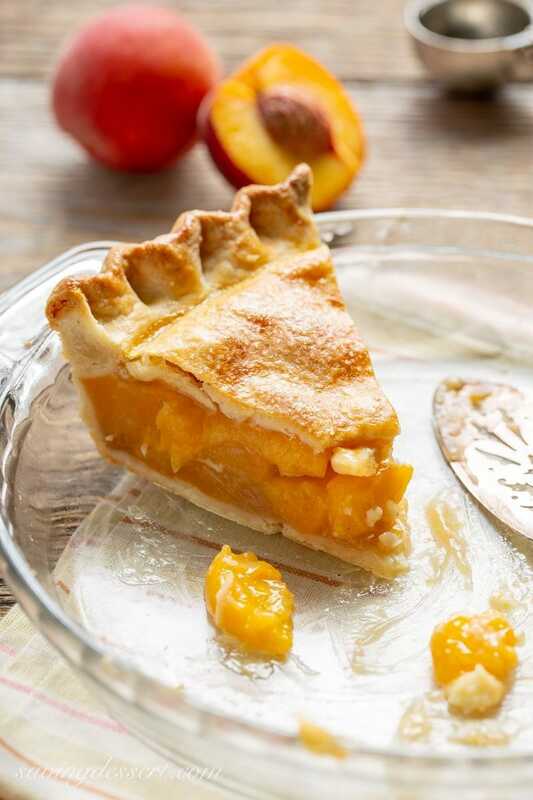 It's hard to beat a fresh peach pie - always a favorite! Prepare and refrigerate a double crust pastry. It's always better to roll it out once well chilled! Peel and slice 6 cups of peaches. Toss the peaches in a large bowl with 1 cup sugar. Cover and set aside for about 1 hour. Prepare a double crust and roll out half the dough. Fit the dough into the bottom of a 9-inch pie plate. Set aside. In a medium saucepan, whisk the corn starch, nutmeg, cinnamon and salt. Drain the peaches reserving the juice. Whisk the peach juice into the corn starch mixture. Cook over medium heat until the syrup boils. Whisk constantly and cook for about 2 minutes or until mixture thickens. 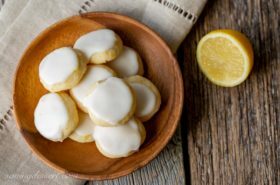 Remove from heat and stir in lemon juice, almond extract, and butter. Carefully fold in the peaches and any extra peach juice. Pour into the crust. Roll out the remaining pastry and place on top of the peaches. Seal and flute the edges. You can make a lattice crust or cut vents in a solid top. Brush the top with a mixture of milk and one beaten egg. Sprinkle with raw or granulated sugar if desired. Cover the edges loosely with foil and bake on the foil lined baking sheet for 40 minutes at 400 degrees. Remove foil and bake an additional 10 minutes or until lightly browned and filling is bubbly. Cool before cutting. Serve at room temperature or slightly warm. Store leftovers in the refrigerator. Top with ice cream and cinnamon if desired. If you find yourself with some extra peaches, try this Peach Lemonade Recipe from The Cookie Rookie. Made with only two ingredients, it’s simple and refreshing. This homemade Peach Freezer Jam from Recipe Girl is well reviewed and sounds easy to make too. It’s a great way to make your fresh peaches last for months! And finally, what could be better than this Brown Sugar Peach Cake from Sue at The View from Great Island. Moist and loaded with peach flavor – it’s a must try this summer! You are killing me with all these pie recipes. I like the way you make your pie crust. Wish I could have shared them with you Susan – thank you! Once I get my kitchen back, I’m going to try out your pie crust! We actually had peach pie for dessert tonight—one of my favorite summer treats. Yours looks perfect!! 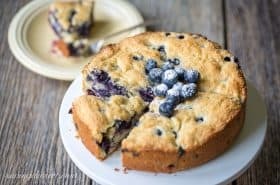 My favorite pie ever- it looks mouthwatering perfect! I know you will post something amazing when your peaches come in – can’t wait! Best peach pie I have ever seen! Thumbs up for you, Tricia. Thank you Angie – it was a good one! This looks delicious! I must be craving pie because I can’t wait to try this. Pinning for later! I agree with your hubby, that pie really does look like the dictionary definition of the PERFECT pie, I love how thick the filling is, mine are always runny 🙂 I want a big bite right now!! Thank you Sue – I could eat some myself – happy weekend! Looks delicious Tricia, especially your crust – my favorite pie part. Peaches and blueberries are in here and I can see a combo pie in out future. This is the ultimate peach pie recipe. Everything comes together quickly and easily. 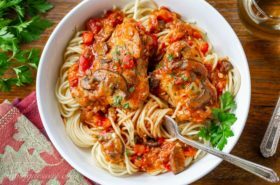 Having much less success with other recipes resulting in runny filling, this filling stands on its own and was truly delicious! And the crust recipe, having both butter and shortening, is the way to go…so flaky but butter-ly goodness. My father, a true pie connoisseur, declared it the ultimate Fathers Day gift! Thank you, Tricia, for helping me conquer my pie making fears. 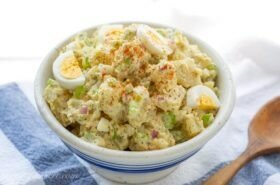 I love your blog and have made so many of your recipes. Keep them coming! Thank you so much Julie! I am so happy you and your father enjoyed the pie, and I’m so proud of you. Congratulations!!! I can’t wait to hear more about your favorite pies in the years to come. Thank you, thank you, thank you!!! I really think frozen might work! Be sure to thaw them first. Let me know if you like it. My only concern is if they are not juicy enough. Good luck! This pie looks amazing. I can't wait for peaches. 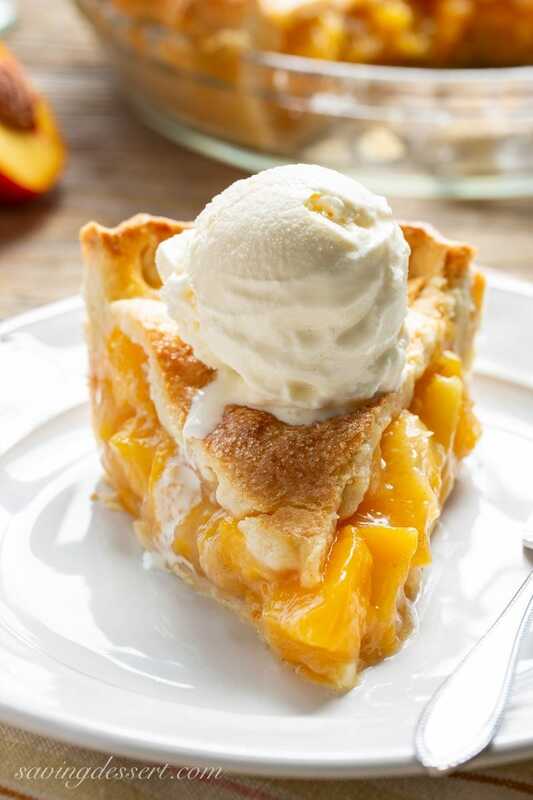 I have so many plans for peaches and I am thinking this pie just made the list. Thanks for sharing! 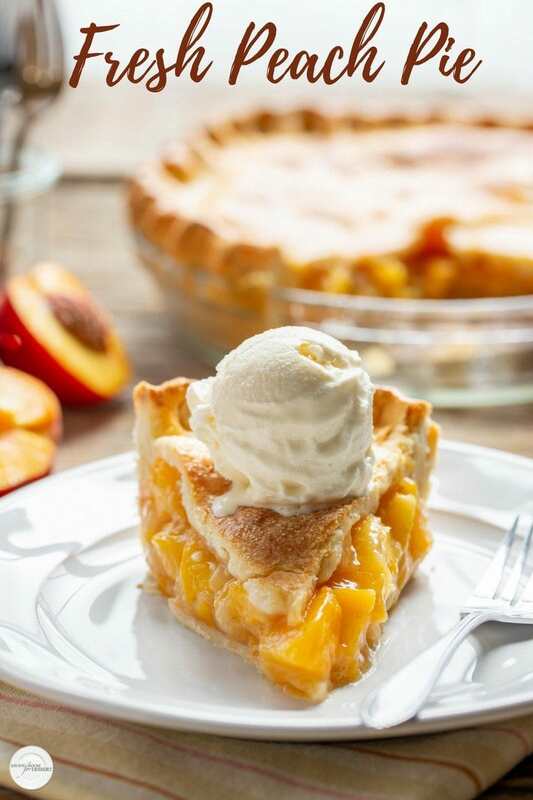 Peach pie is one of our favorites and this just looks so delicious!! Your pie is gorgeous, Tricia! I've been craving a peach cobbler for weeks and now I'm actually considering a pie instead. I picked up some amazing peaches yesterday and they are calling to me.